Things I've Found In Pockets: 100 Years of International Women's Day! 100 Years of International Women's Day! International Women's Day. 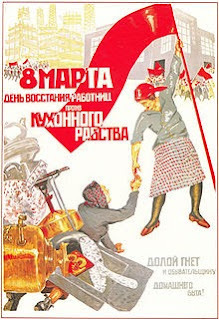 Now celebrated in more than 100 countries, including Afghanistan and Nepal where it is an official holiday, Women's Day marked the beginning of the Russian Revolution in 1917. I'm getting involved in the Women's Day activities around here, because it'll be fun and it's good to get involved. But how do these official days manage to get so big? How on earth can a country like Afghanistan, where girls have to fight to be educated, have an official Women's Day holiday? Obviously, it does not mean the same thing everywhere. Luckily, my sense of humour is intact. Hell, I live in a state where the governer wants to repeal a bill that mandates insurance companies covering birth control pills. We need international women's DECADE to fix all that's wrong. OMG I have GOT to show this video to Annie. Well. Maybe not. Seeing it, she may well spend the rest of her life hunting down the producer of that video. That made me laugh. Does it mean I'm old if I can remember similar silly suggestions as a young girl growing up? One of the nuns recommended docility as a good attitude for girls to adopt. What drivel. Luckily, the 60's hit and gave us some different options! As a historical note, however, I will just remind everyone that these silly "International Day"s of whatever have placed massive international pressure on non-participating,non-believing, non-accepting countries to DO SOMETHING,NOW. It might be incremental, but it does work. Slowly. Which means that by 2150, the burka will be a thing of the past. Or maybe 2500. Harry Enfield should never be taken seriously. He does sketches for almost everything. I have actually sat with my Grandmother and giggled at some of his sketches! I like comedians who can take topics and put a humourous spin on them... reminds us not to take ourselves too seriously and to have a laugh every now and then! Without laughter the world would be a very boring place.